Offering excellent protection from leg interference, Valena Boots are great for any riding discipline as well as for turnout. Made from durable, heavy-duty vinyl with wide elastic and Velcro straps. Featuring WoolBack lining, a dense pile wool fabric offering great protection from concussion while wicking moisture away from the leg. The fleece stays lofty and won't mat after heavy use and washing. Easy care: machine washable and dryer safe. Cost almost $80 new, these boots are in excellent hardly used condition. Measures 6 3/4" high x 11" wide not counting strap. Woof Sport/Club Fetlock Boots are a general-purpose boot ideal to protect the horse's hind fetlock from knocks and strike injuries during every day schooling and show jumping. Sturdy neoprene with protective shell, Velcro closure. Boots are light and flexible even when wet and they will not absorb water! Recessed stitching for longer life. Machine wash cold on gentle cycle with mild detergent, line dry. Not marked as to size, but measures approx 6” tall x 9 1/2” wide not including Velcro. When checked with Woof Wear company, they say this is the size Small. Sold in pairs. Excellent used condition, clean, minor scuffs to hard shell front. 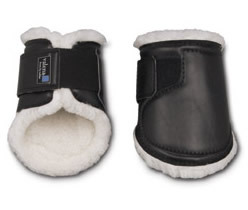 Walsh ankle boots features soft, neoprene pad while providing comfort and protection. Tough thermo plastic outer shell protects against impact. Molded fit conforms to ankle. Sturdy neoprene with protective shell, Velcro closure. A great general purpose boot ideal to protect the horse's hind fetlock from knocks and strike injuries during every day schooling and show jumping. Not marked as to size, but measures approx 6” tall x 10” wide not including Velcro. Think this is an older version of what's available today, as it has a plastic buckle for Velcro to slip through before folding back on itself. Sold in pairs. Excellent used condition, clean, minor scuffs to hard shell front, minor dirt marks inside. Designed to give added protection to the ankle. Great for schooling, trail, or competition. 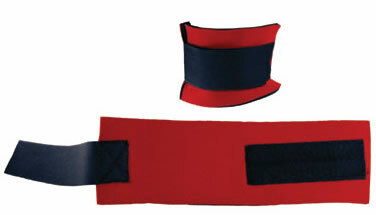 Heavy 5/16" premium neoprene, suede wear patches, Loop-N-Lock Velcro fastening system, and proven design for excellent fit. Not marked as to size as size part of tag was removed, but measures approx 5 1/8” tall x 10” wide not including straps. Sold as a pair. New, never used, minor dust from shop handling. 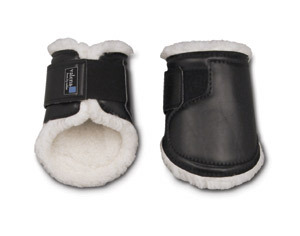 These ankle boots feature a neoprene pad while providing comfort and protection. Tough leather outer shell protects against impact. Molded fit conforms to ankle. 2 buckle/leather strap closure. 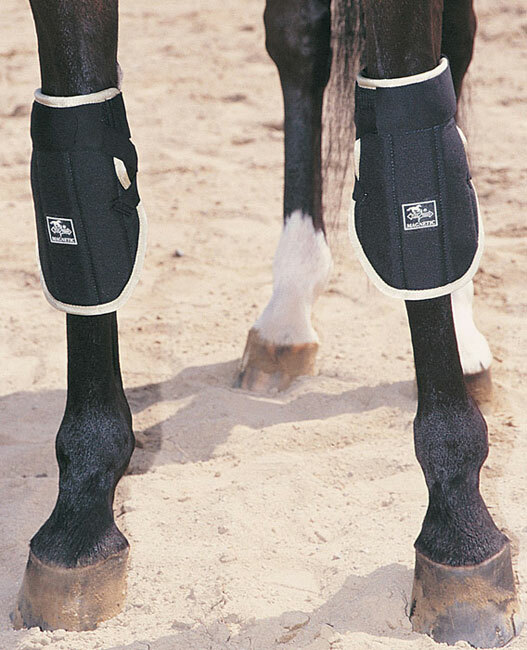 A great general purpose boot ideal to protect the horse's hind fetlock from knocks and strike injuries during every day schooling and show jumping. Not marked as to size, but measures approx 5 1/2” tall x 10 1/4” wide not including straps. Sold in pairs. Good used condition, some scuffs to hard shell front, a few dings to neoprene, & some dirt. Brand unknown. The Magnetic fetlock/pastern boot is a great product for those who actively campaign their horses for prolonged periods of time. Being one of the most injured areas on the equine athlete, we now have a method to help reduce the effects of constant and repeated stress on this area. The most common uses for this boot are for the treatment of windgall, sesamoiditis, arthritis, green osselets, edema and pre-warm up. It is recommended both before and after workouts when an increase in circulation is deemed the most beneficial. Strong cordura nylon outer, soft acrylic fleece lining, & has Velcro closures which allow adjustment to fit all leg sizes. Vecro is not sewn on so can be positioned as needed for best fit. Magnet therapy increases circulation, speeds recovery process of swelling, arthritic discomfort and minor fractures, helps reduce inflammation, helps stimulate tissue after surgery or injury, increases oxygen to injured area, accelerates injury rehabilitation, & is drug free, safe and effective. Eliminates pin firing or blistering. Convenient and humane therapy. Brand unknown, possibly homemade, fits around cannon bone & fetlock/pastern area. We tried these boots on a variety of sized horses from a petite Arabian, an average QH & a 16hh TB & boots fit with velcro provided. 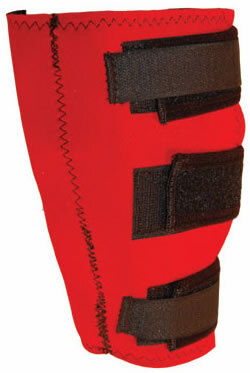 What makes Protecto's Dual Action Magne-Sweats stand out above the rest is the double-working action. One action is through the sweat action and the other is through the magnets. This dual action increases the blood supply to the affected area by bringing the much-needed nutrients and oxygen to speed up the natural healing process. When the bloodstream passes through the magnetic field created by the magnets touching the skin, a small current is created. This current stimulates the circulation of blood, lymph, nerve and electro-magnetic force and improves chemistry, and so promotes the health of every cell in the body. For the pastern area of horses legs. Sold as a pair. 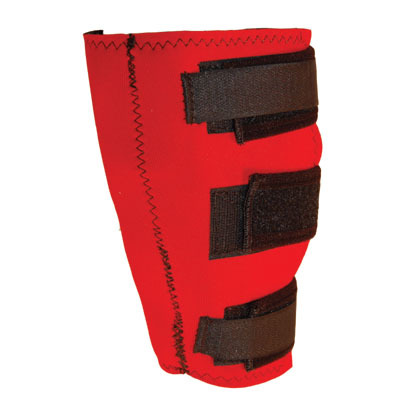 What makes Protecto's Dual Action Magne-Sweats stand out above the rest is the double-working action. One action is through the sweat action and the other is through the magnets. This dual action increases the blood supply to the affected area by bringing the much-needed nutrients and oxygen to speed up the natural healing process. When the bloodstream passes through the magnetic field created by the magnets touching the skin, a small current is created. This current stimulates the circulation of blood, lymph, nerve and electro-magnetic force and improves chemistry, and so promotes the health of every cell in the body. For use on horses knees. Sold as a pair. 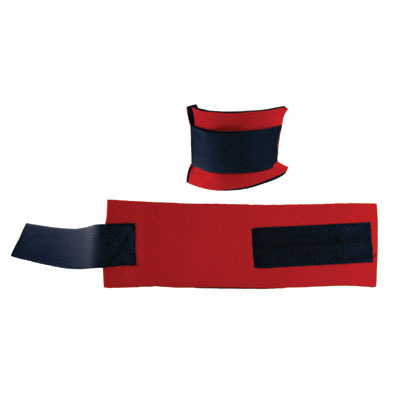 Designed to protect your horse's ankles against brushing and bruising. Can be used during shipping or to reduce swelling. Use of the ankle boots will eliminate the chore of bandaging. These ankle boots are made of neoprene material, formed for proper fit & have 3 hook and loop closures to allow for an easily adjustable, secure fit. They are also completely washable. 7 3/4" at tallest point x 5" at widest point. Could possibly be used as hock sweats or hock boots for ponies. Some light scuffs or abrasions on boots, mainly near bottom(see inset). Sold as a pair. 2 pair available.